In 1930, after only 15 minutes of instruction, Amelia Earhart became the first woman to fly an autogiro in the Pitcairn-Cierva PCA-2. In 1930, after only 15 minutes of instruction, Amelia Earhart became the first woman to fly an autogiro, which featured rotating blades to increase lift and allow short takeoffs and landings. The Pitcairn autogiro was a contender in the safe-to-fly/no-stall airplane movement, which was undertaken to attract more civilian pilots. Earhart set the first autogiro altitude record and made two autogiro cross-country tours, which were marked by three public “crack-ups,” as she called them. Stephen Pitcairn, son of Harold Pitcairn — the founder of the company — commissioned this model from Clarence Jacoby Jr. for the Museum. 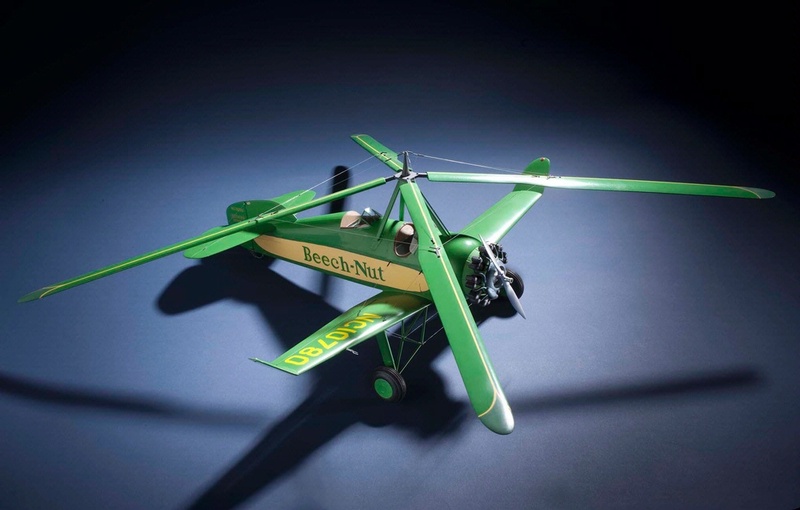 Find out more about Pitcairn-Cierva PCA-2 Beech Nut Autogiro, 1:16 scale.